Leaving Long Cove we'll paddle out to the entrance to Lankford Creek and enter the Chester River. Traveling over the shallows on our way to Gray's Inn Point, we'll pass large waterfront farms. Wind and waves from the southwest have scored much of the shoreline into shallows. Passing Gray's Inn Point we'll begin our journey up Gray's Inn Creek. We'll land at a small beach on the right just inside the creek entrance. A beautiful brick homestead may be seen in the distance. Traveling further up the creek, fields and lowlands give way to dense forest where herons, swans and eagles are often sighted. 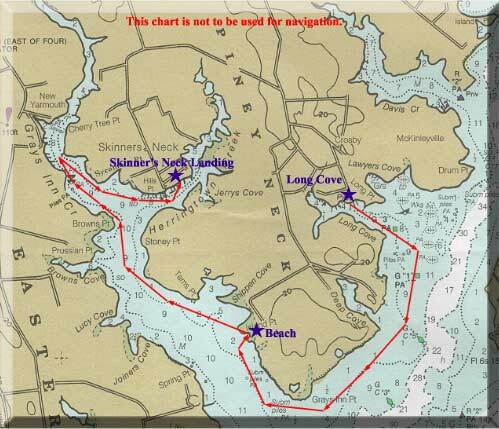 We'll paddle up the left fork a bit before turning for Herrington Creek and our final destination at Skinner's Neck.